I love, love, love potatoes. They are one of the most amazingly versatile vegetables out there and I will eat them anyway they come. And if you love potatoes just as much as I do, then you are going to fall in love with this scrumptious meal idea. 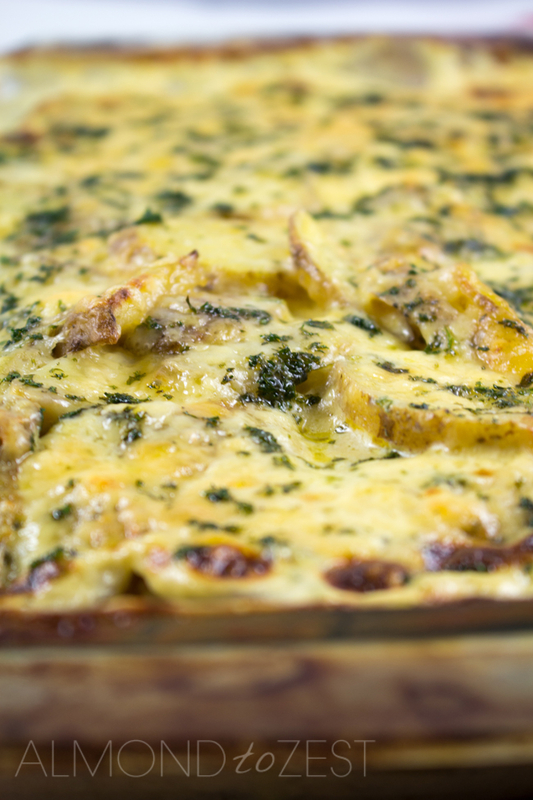 This dish is like a cross between a potato gratin and a potato lasagne. Have I got you interested? I hope so. 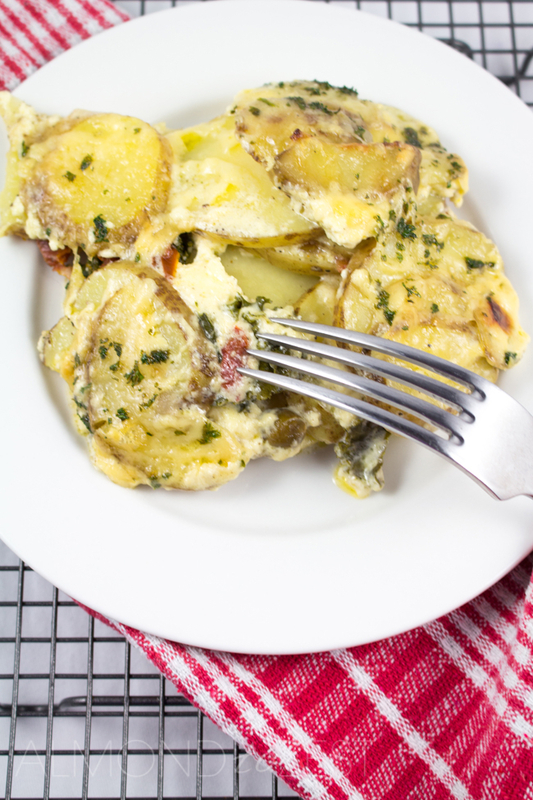 Like your classic gratin, this dish consists of lots and lots of thinly sliced potatoes. These are scattered in layers and then drenched in a creamy sauce. And of course it would not be complete without copious amounts of cheese grated on top. But to make this heavenly spud filled dish more exciting I have added a layer of tasty flavors sensations. 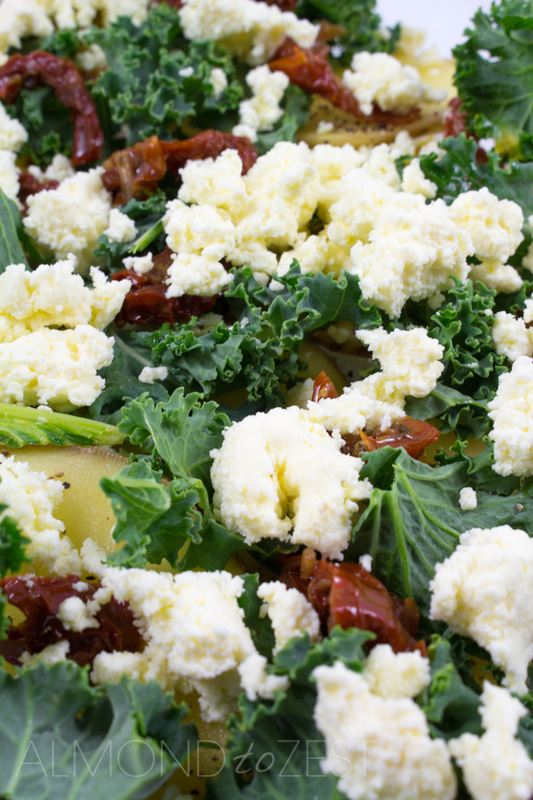 Torn pieces of kale, tangy strips of sundried tomatoes and my creamy homemade ricotta are placed between each layer of potatoes. Making it kinda like a lasagne, but with potatoes. This dish looks mouth watering good when it emerges from the oven. 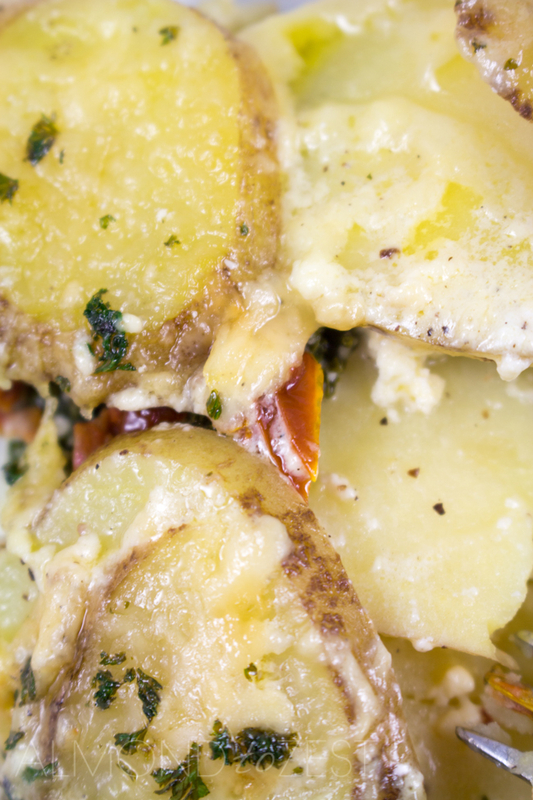 Soft, tender potatoes in a bubbling cauldron of creamy sauce, encrusted with melted cheese. I mean how spectacular does that sound? This gratin can be made to share with a crowd, like at a family gathering, barbeque or potluck diner. But it is also satisfying enough to be eaten as the main event for dinner. A must try for all you vegetarians out there. Heat oven to (200C). Take a 11” x 7” glass baking dish or simular and line the bottom with a layer of about ¼ of the potatoes. 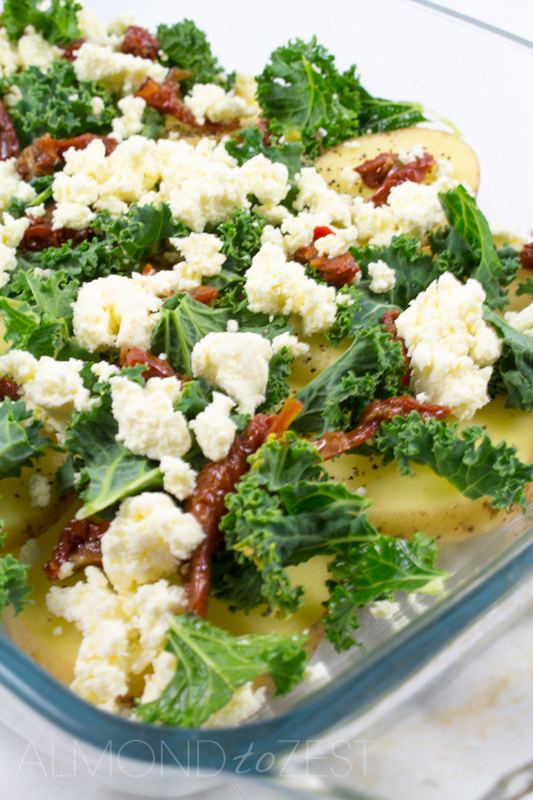 Distribute ⅓ of the kale, ricotta and sun-dried tomatoes over the top of the sliced potatoes. 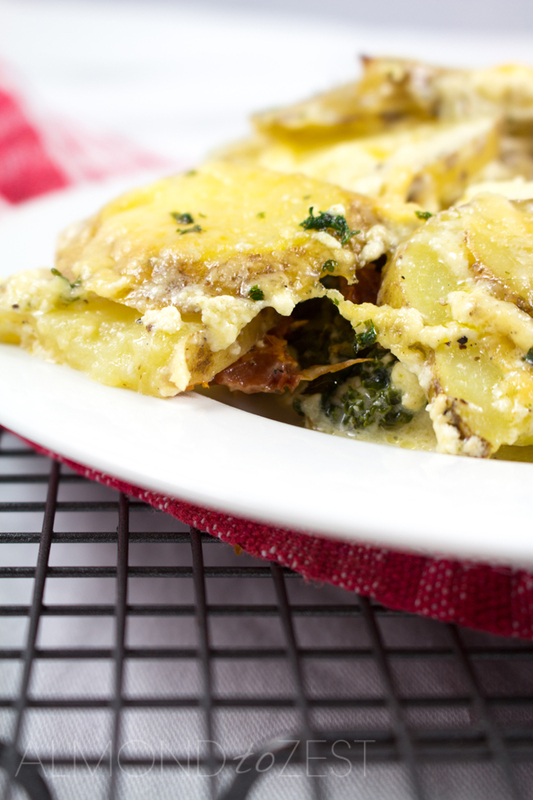 Cover with another layer of ¼ of the potatoes and cover again with ⅓ of the kale, ricotta and sun-dried tomatoes. Layer with ¼ of the sliced potatoes again and repeat the process finishing with a layer of sliced potatoes on top. Whisk together the milk and cream and season well with salt and pepper. Pour the liquid into the baking dish and press the potatoes down lightly to wet in the milk/ cream mix. Cover baking dish well with aluminium foil and bake in oven for 1 hour. Remove baking dish from oven and discard the aluminium foil. Spread the grated cheese over the top, sprinkle over parsley and return to oven for around 20 minutes or until golden brown. Let stand for 10 minutes before serving. This is a fabulous recipe, thank you. I used fresh garlic chives instead of parsley. Great, so glad you enjoyed it!